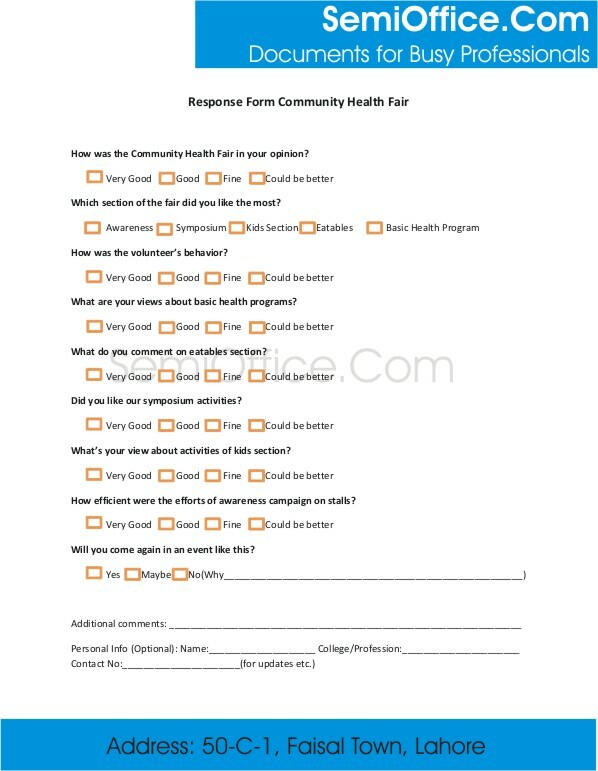 Sample survey form template in word from the visitors, volunteers, participants of any event. You can use this survey form sample for any type of survey by changing any type of questions. Survey form for collecting opinion, likes and dislikes, eatables, stalls and views regarding the particular event etc. How was the Community Health Fair in your opinion? Which section of the fair did you like the most? How was the volunteer’s behavior? What are your views about basic health programs? What do you comment on eatables section? Did you like our symposium activities? What’s your view about activities of kids section? How efficient were the efforts of awareness campaign on stalls? Will you come again in an event like this? Sample feedback form for customers and clients available for free. Download the feed back form in Ms word.